The provocator gladiator was the fighter that most resembled a typical Roman soldier in their earlier introductions to the arena. Later as they became a recurring fighter class, their style, weaponry and armament evolved, but they still held many commonalities with their origins. The provocator typically only fought another provocator, and due to their heavily armoured style, this probably made the fight much fairer. Battles between these two warriors might have been lengthy or technical, with both provocatores fighting to get the upper hand. The name provocator literally can be translated as ‘challenger’ and these gladiators were indeed challengers. As the provocatores roots stemmed from a Roman soldier, their common weapon was the gladius sword, a highly capable sword in the hands of a skilled fighter. The gladius was a short and straight sword that curved in on the sides, giving it a slightly flared head, similar to that a leaf. The gladius was edged on both sides making it a well balanced weapon with the ability to work with a variety of techniques. The most interesting thing about the gladius sword however is its name, the gladius, the birth of the word gladiator was bore from its blade. It’s more than likely that the very fight gladiator fight was between two men using their military weapons, which were likely of course gladius swords. The provocators clash their shields in a battle of strength. The provocator gladiator as we mentioned earlier had evolving style and armaments, but apart from the very heavily armoured crupellarius gladiator, the provocator was one of the best armoured gladiators to have fought. Common features for this gladiator class were a helmet, shield, breastplate, a manica and a greave. The provocatores helmet was a round top helmet with circular eye grates and often was decorated with two feather plumages on either side of the head. Decorate and defensive this helmet allowed this gladiator to defend themselves effectively from bladed head strikes. The shield of this gladiator would have started off as a traditional scutum in line with the history of this class representing a roman legionary. There are various carvings showing the provocator with a large square scutum, perfect for forming a defensive line with their leg greave and helmet. While the provocator had a breastplate it was rather small, only covering the middle of the upper torso, but in reality with all the other armour this gladiator had they didn’t need a large piece of armour here. By having a smaller breast plate as well the provocator would have kept more mobility and movement in their arms, making it easier to move and attack. The provocator had a greave to protect their forward facing leg, and in combination with their shield and helmet, they could create a solid line of protection from foot to head using all three. On their weapon arm the provocator had a Manica to protect their arm while reaching out for attacks, both the manica and greave of the provocator were typically made from metal and had cloth padding where they were attached to the limbs to prevent rubbing and chafing. The provocator only had one opponent in the amphitheater another provocator. Two provocators fighting, one in blue and one in red. The provocator was not as mobile as some gladiators due to their fairly heavy set of armour, and with a gladius sword as their primary weapon, the provocator would have had to fight in close. 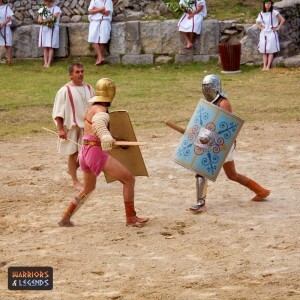 While the equipment for these gladiators was fairly standard, the fact that provocatores were pitched against each other mean’t this battle would have been akin to a fighting chess match. Both gladiators would be careful about closing the distance on their foe, likely keeping their defenses high, with shield high and the greave facing forward to protect their leg. Stamina and endurance might well have come into play with two provocatores slugging it out in the arena, whoever had the most left to fight might end up with the upper hand. 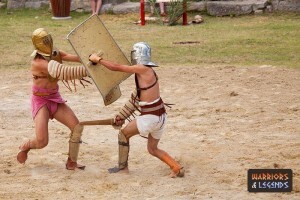 No doubt this would have been a well matched battle between two suitably armored gladiators. Overall the provocator was a well armored class of gladiator, and likely the pairing of two provocatores triggered a highly competitive battle, that mean’t the winner was the more skillful or luckier of the two fighters. While the styling of these gladiators changed over time, the provocator was a good solid prospect for the crowds in the the roman amphitheaters to watch, likely always putting on a good show.